Amazon, Microsoft, Apple and China’s Baidu are on a worldwide hunt for terabytes of human speech. Microsoft, for instance, has mock apartments to record volunteers speaking in a home setting. The companies use such data to teach their computers how to understand and respond. Amazon’s Echo has made tangible the promise of an artificially intelligent personal assistant in every home. Those who own the voice-activated gadget (called Alexa, after its female interlocutor) are prone to proselytizing “her” charms, applauding Alexa’s ability to call an Uber, order pizza or check a 10th-grader’s math homework. 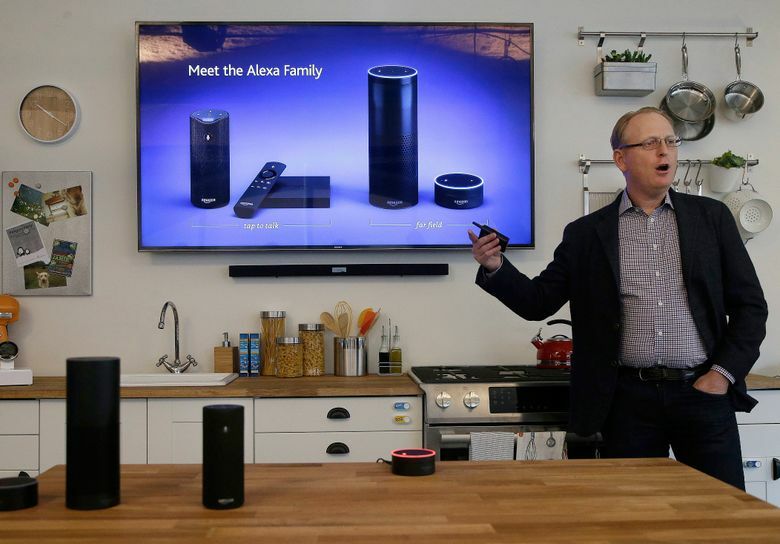 The company says more than 5,000 people a day profess their love for Alexa. On the other hand, devotees also know that unless you speak to her very clearly … and … slowly, she’s likely to say: Sorry, I don’t have the answer to that question. Voice recognition has come a long way in the past few years. But it’s still not good enough to popularize the technology for everyday use and usher in a new era of human-machine interaction, allowing us to talk with all our gadgets — cars, washing machines, televisions. Despite advances in speech recognition, most people continue to swipe, tap and click. And probably will for the foreseeable future. What’s holding back progress? Partly the artificial intelligence that powers the technology has room to improve. There’s also a serious deficit of data — specifically audio of human voices, speaking in multiple languages, accents and dialects in often noisy places that can defeat the code. So Amazon, Apple, Microsoft and China’s Baidu have embarked on a worldwide hunt for terabytes of human speech. Microsoft has set up mock apartments in cities around the globe to record volunteers speaking in a home setting. Every hour, Amazon uploads Alexa queries to a vast digital warehouse. Baidu is busily collecting every dialect in China. Then they take all that data and use it to teach their computers how to parse, understand and respond to commands and queries. Not long ago, voice recognition was comically rudimentary. An early version of Microsoft’s technology running in Windows transcribed “mom” as “aunt” during a 2006 demo before an auditorium of analysts and investors. When Apple debuted Siri five years back, the personal assistant’s gaffes were widely mocked because it, too, routinely spat out incorrect results or didn’t hear the question correctly. When asked if Gillian Anderson is British, Siri provided a list of English restaurants. Now Microsoft says its speech engine makes the same number or fewer errors than professional transcribers, Siri is winning grudging respect, and Alexa has given us a tantalizing glimpse of the future. Much of that progress owes a debt to the magic of neural networks, a form of artificial intelligence based loosely on the architecture of the human brain. Neural networks learn without being explicitly programmed but generally require an enormous breadth and diversity of data. The more a speech-recognition engine consumes, the better it gets at understanding different voices and the closer it gets to the eventual goal of having a natural conversation in many languages and situations. When the industry began working seriously on voice recognition in the 1990s, companies like Microsoft relied on publicly available data from research institutes such as the Linguistics Data Consortium, a storehouse of voice and text data founded in 1992 with backing from the U.S. government and at the University of Pennsylvania. Then tech companies started collecting their own voice data, some of it garnered from volunteers who came in to read and be recorded. Now, with the popularity of speech-controlled software gaining ground, they harvest much of the data from their own products and services. When you ask Alexa what the weather is or the latest football score, the gadget uses the queries to improve its understanding of natural language (although “she” isn’t listening to your conversations unless you say her name). “By design, Alexa gets smarter as you use her,” says Nikko Strom, senior principal scientist for the program. One of the key challenges is getting the technology conversant with multiple languages, accents and dialects. Nowhere, perhaps, is this more crucial than in China. Seeking to harvest dialects from all over the country, Baidu launched a marketing campaign during Chinese New Year earlier this year. Calling the push a “dialect conservation initiative,” the search giant promised people that if they contributed they would help usher in a future when they would talk to Baidu using their dialect. In two weeks, the company recorded more than 1,000 hours of speech to plug into its computers. Many people did it for free simply because they were proud of their hometown dialects. A high school teacher in Sichuan was so excited about the program, he asked a class of students to record more than 1,000 ancient poems in Sichuanese. Another challenge: teaching voice-recognition technology to pick up commands over background noise — the clamor of happy hour, say, or the cacophony of a sports stadium. Microsoft has deployed an Xbox app called Voice Studio to harvest conversation over the din of users shooting villains or watching movies. It offered rewards including points and digital apparel for avatars and lured hundreds of subjects willing to contribute their game chatter to Microsoft’s speech efforts. The program worked gangbusters in Brazil, where the local subsidiary promoted the app heavily on the main Xbox page. The data was used to create the Brazilian Portuguese version of Cortana, released this year. Companies are also designing voice-recognition systems for specific situations. Microsoft has been testing technology that can answer travelers’ queries without being distracted by the constant barrage of flight announcements at airports. The company’s technology is also being used in an automated ordering system for McDonald’s drive-thrus. Trained to ignore scratchy audio, screaming kids and “ums,” it can spit out a complicated order, getting even the condiments right. Amazon is conducting tests in automobiles, challenging Alexa to work well with road noise and open windows. Google generally subscribes to a less-is-more philosophy, deploying a piecemeal approach that uses unintelligible units of sound to build words and phrases. With its speech-recognition system, it aims to solve multiple problems with just one change. For its data sets, Google strings together tens of thousands of audio snippets that are typically two to five seconds long. The process requires less computing power and can be more easily tested and tweaked, says Google researcher Françoise Beaufays. For its part, Baidu is working on more efficient algorithms where learning one language makes it easier to learn the next 12. That’s particularly important for those spoken by tens of thousands of people rather than millions, where there just won’t be huge swaths of data no matter what, says Ng, the company’s chief scientist. Ask researchers like Ng when it will be possible to speak naturally to your digital assistant and they get wistful. No one really knows. Neural networks remain mysterious even to those who understand them best. And much of the work is trial and error. Based on the current technology and methods, the process will probably take years. But Ng, Huang, Beaufays and other scientists say you never know when a breakthrough will arrive, catapulting research forward and turning Alexa and Siri into true conversationalists.